When a 4-month-old boy’s head began to grow abnormally large, doctors were right to assume that something was seriously wrong. After a brain scan revealed a tumor, doctors underwent surgery to remove it. What they found was astonishing — multiple teeth forming inside of his brain due to a very specific type of brain tumor: craniopharyngioma. The baby boy underwent brain surgery at the University Of Maryland Medical Center, where Drs. Narlin Beaty and Edward Ahn, physicians at University of Maryland Medical Center and Johns Hopkins Children’s Center, respectively, determined the boy had a craniopharyngioma, a benign brain tumor that develops near the pituitary gland. The rare brain tumor can grow to be larger than a golf ball. However, unlike other types of tumors, this one does not spread. “It’s not every day you see teeth in any type of tumor in the brain. In a craniopharyngioma, it’s unheard of,” Beaty told Live Science. Beaty, however, said that this is not the first time that teeth have been found in a human brain, since they’ve been appeared in teratoma tumors. This was a similar case for a young woman in India. Twenty-three-year-old Nagabhushanam Siva was shocked when she found out that doctors had found two full-formed teeth in the tumor that she had, not in her brain, but in her eye. Also, in 1978, a young man named Doug Pritchard felt a sharp pain in his foot for several weeks before he decided get it checked out. Upon inspection, physicians found a tooth growing in his left foot. However, those tumors, teratomas, contain all the types of tissues found in early-human development — meaning, they have the components of a human child. In contrast, a craniopharyngioma only has one layer. The 2-millimeter-by-2-millimeter devices (pictured) are made up of a film of polymers that detects chemicals in its environment. Sandwiched between two square-shaped gold rings that act as antennas, the sensor can transmit information on what’s going on—or what’s being chewed on—in our mouth to a digital device, such as a smartphone. The type of compound the inner layer detects—salt, for example, or ethanol—determines the spectrum and intensity of the radiofrequency waves that the sensor transmits. Because the sensor uses the ambient radio-frequency signals that are already around us, it doesn’t need a power supply. The researchers tested their invention on people drinking alcohol, gargling mouthwash, or eating soup. In each case, the sensor was able to detect what the person was consuming by picking up on nutrients. The devices could help health care and clinical researchers find links between dietary intake and health and, in the long run, allow each of us to keep track of how what we consume is affecting our bodies. 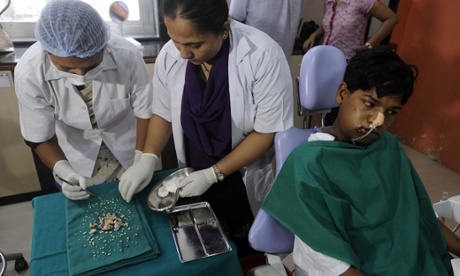 Surgeons in Mumbai have removed 232 teeth from the mouth of an Indian teenager in what they believe may be a world-record operation. Ashik Gavai, 17, sought medical help for a swelling on the right side of his lower jaw and the case was referred to the city’s JJ hospital, where they found he was suffering from a condition known as complex odontoma, said head of dentistry Sunanda Dhivare-Palwankar. “We operated on Monday and it took us almost seven hours. We thought it may be a simple surgery but once we opened it there were multiple pearl-like teeth inside the jaw bone,” she said. After removing those they found a larger “marble-like” structure that they struggled to shift and eventually had to “chisel out” and remove in fragments. Ashik’s father, Suresh Gavai, said the family had been worried that the swelling was a malignant growth. “I was worried that it may turn out to be cancer so I brought him to Mumbai,” Gavai told the Mumbai Mirror newspaper. 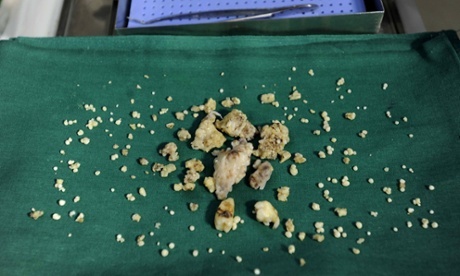 Dhivare-Palwankar said the literature they had come across on the condition showed a maximum of 37 teeth being removed in such a procedure, whereas she and her team had counted more than 232 taken from Gavai’s mouth. “I think it could be a world record,” she said. Gavai’s jawbone structure was maintained during the operation so it should heal without deformities, the surgeon added. Thanks to Dr. Nakamura for bringing this to the attention of the It’s Interesting community.